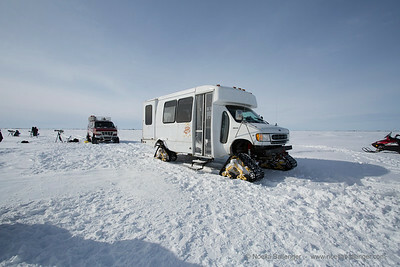 Traveling across frozen lakes and stretches of tundra in these vehicles was a challenge. Think bucking bronco and then some. We had some car trouble and one of the others came back to get us. 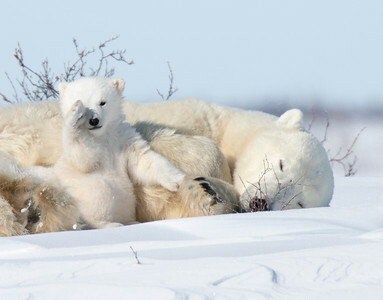 We were able to get close enough to the bears to use long lenses to capture their movements but far enough away not to disturb and still maintain safety. 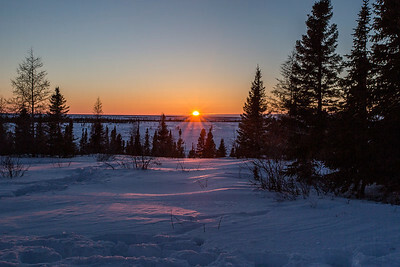 The temperature ranged from about -25 to -40 degrees Fahrenheit. Camera gear as well as bodies had protection. 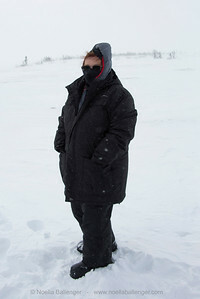 I had so many layers of clothing on that I felt like a polar bear. 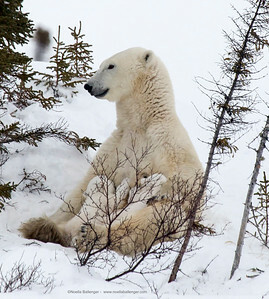 But those layers (wool, silk, synthetic - no cotton) allowed us to be outside enjoying this fabulous opportunity to be with the bears. 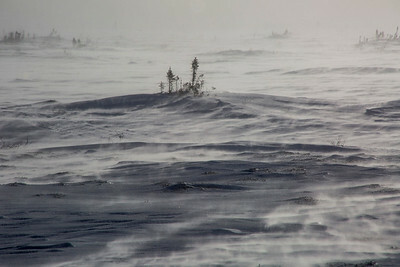 Temperatures dropped to -40F and the wind blew strong at times. 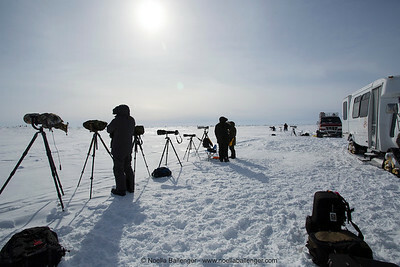 Wind blowing across tundra and frozen lakes dropped the temperatures to the extreme. 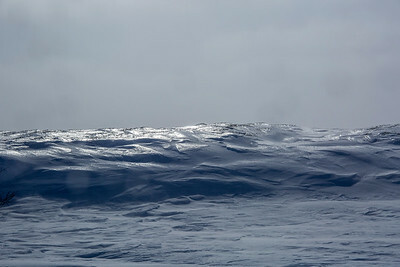 Snow and ice made frozen landscapes look like ocean swells and waves. 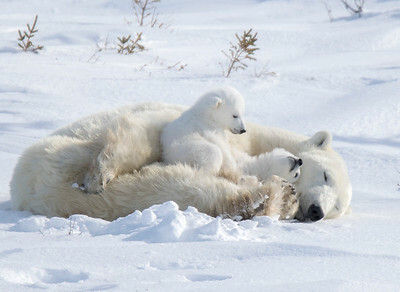 It is difficult to describe the size and beauty of the polar bear but awesome is a good word to start with. 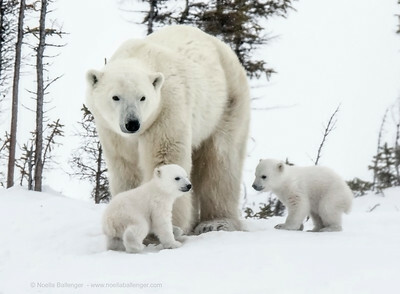 We spent each day watching the behavior. She slept with them tucked into the tummy area and they were wiggly little kids. They started playing and chewing on her and each other. then she sat up and they came in to nurse. 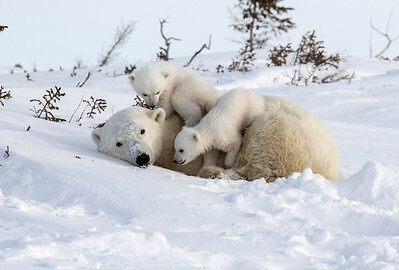 The mothers were always watchful but seemed to rest as much as they could. 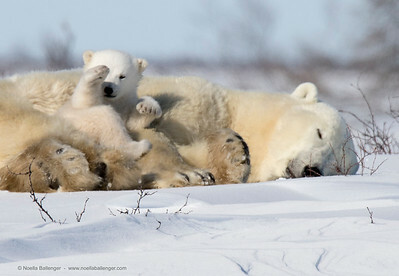 Raising two cubs is a definitely a "paw full". 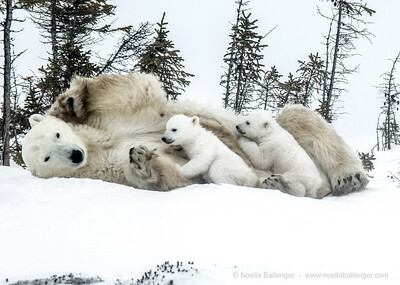 Babies used mom as a play pen, feeding station, referee and best pal. Babies were always ready to eat! 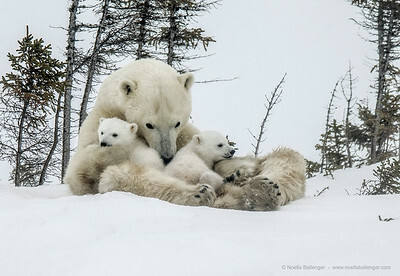 There was lots of cuddle time with babies after they were full. Each baby had a personality of it's own. This one seemed to be the more active of the pair. 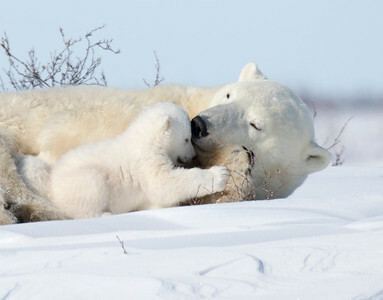 Tender moments between Mom and cub. 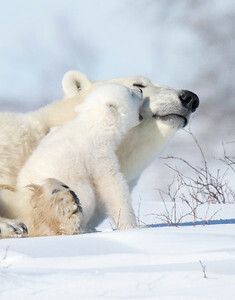 Tender moments between Mom & Cub. Young cub took an interest in the noise of the cameras. 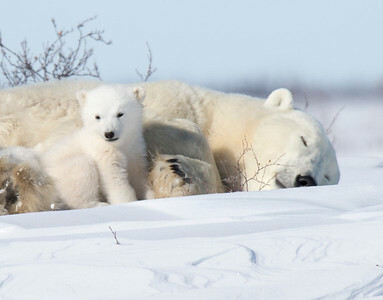 Twins are quite common with polar bears. Triplets are not as common. Almost lunch time but first pose for a family photo. 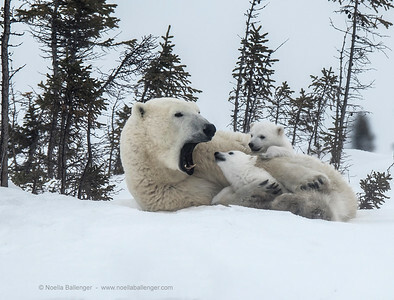 Lunch time with two hungry cubs. 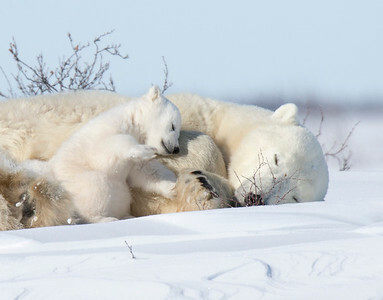 Churchill is the southern most breeding ground for Polar Bears. 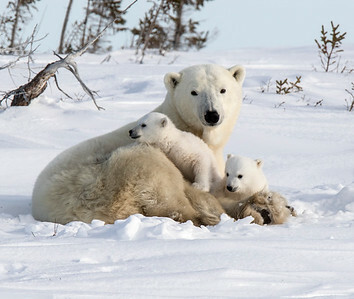 Impregnated by fall, mother bears make a den and stay their after their babies are born in January. 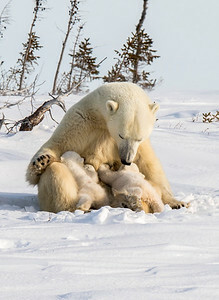 They bring the cubs out of the den by late February and begin their long trek to the Hudson Bay before the ice breaks. 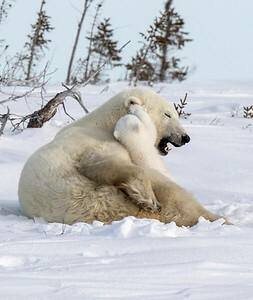 During this time Mother has not eaten. After play time, it's back to cuddling and resting.